Posted April 6th, 2012 at 1:10 am | Log in to reply. This was really really delicious. Wonderful delicate flavored broth, thank you for this recipe. 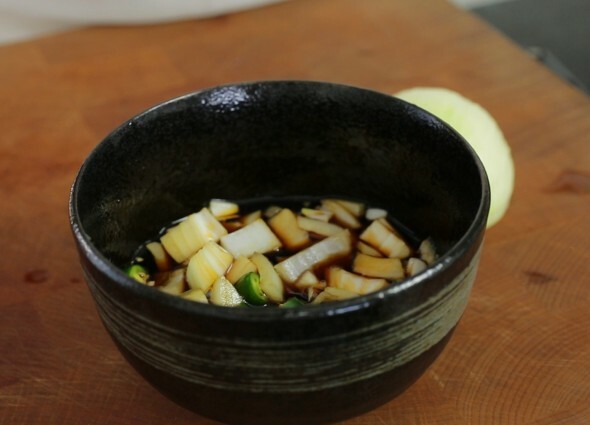 I was fortunate to find some fresh ginseng at the Korean grocery store, and immediately wanted to make your recipe. 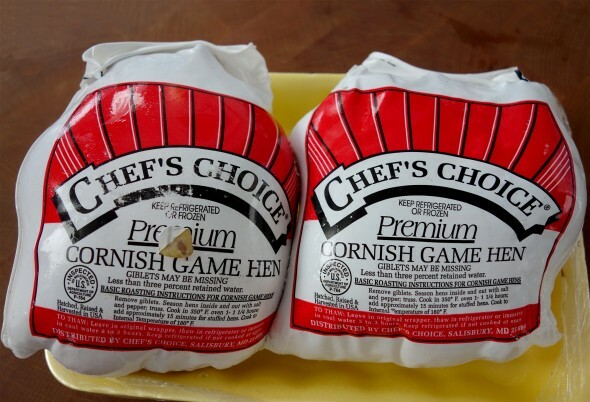 I made this with both a small chicken and cornish game hen! They were both really good. 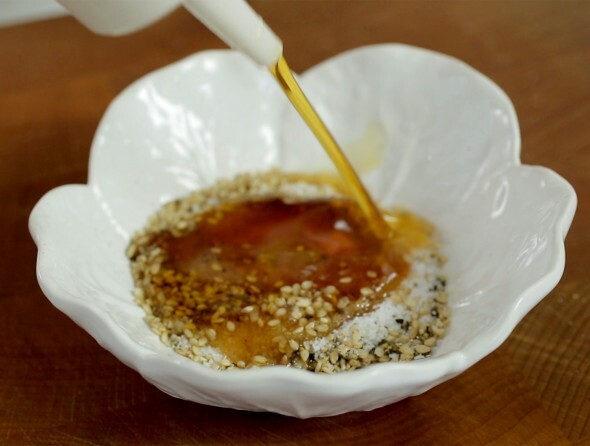 Thank you for sharing this truly traditional old world korean recipe. I remember my mom making this for my dad when I was growing up. Posted January 26th, 2012 at 7:39 am | Log in to reply. 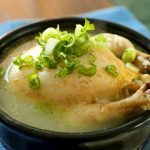 I’m living in Korea, and just stumbled on this blog after a quick search for 삼계탕. My reaction? OMFG. I’m never going to a restaurant again! Or, at least, less. Thank you so much for making this website~~~<3! Posted January 26th, 2012 at 11:11 am | Log in to reply. Posted November 20th, 2011 at 9:13 pm | Log in to reply. I love your recipes! Lucky for me we have a Zion Korean Market in my city so finding ingredients is really easy. I have question, for the ginseng, do you need to peel it first or do you just put it in the hen as is? Thanks! Posted November 21st, 2011 at 1:33 am | Log in to reply. You don’t have to peel it. Posted September 16th, 2011 at 1:44 pm | Log in to reply. Posted November 21st, 2011 at 1:34 am | Log in to reply. Skip ginseng then. It will still be delicious. Posted October 28th, 2012 at 10:54 pm | Log in to reply. I know this was posted almost a year ago, but if you ever get to read this Urahara, I think you’ve been misinformed. 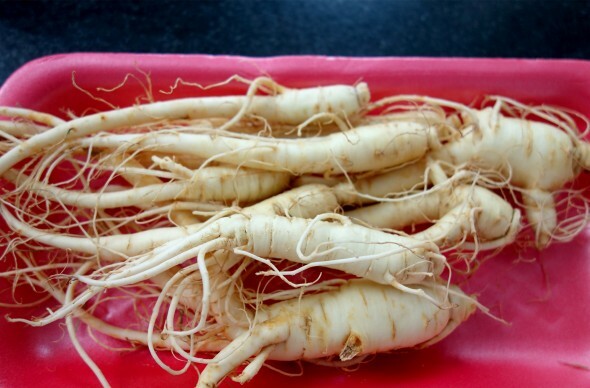 Who told you that fresh ginseng is illegal to buy in Canada? It seemed improbable, so I tried looking it up, and nowhere did it say that fresh ginseng is illegal to buy, sell, or export. Hopefully, you found out the truth and was able to make yourself some samgyetang, because it would be such a pity not to haha. Posted July 9th, 2011 at 8:13 am | Log in to reply. Posted December 31st, 2010 at 3:42 am | Log in to reply. Can I substitute the dried root ginseng with ginseng extract instead. That’s what I have presently. If so how much should I use with the chicken stuffing. Thnx. Posted December 16th, 2010 at 1:25 pm | Log in to reply. 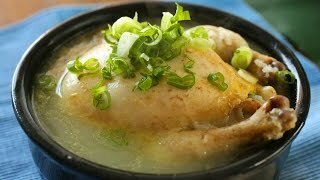 Is samgyetang eaten during winter b’cos of the cold weather? Do you eat this on its own or with rice and other side dishes. The jujubes look like red dates(taste sweet right?). I must ask my sister to buy me some Korean ginseng during her vacation in Korea. I would like to follow exactly the ingredients that you use. I’m curious as to how it taste. Posted December 16th, 2010 at 1:48 pm | Log in to reply. 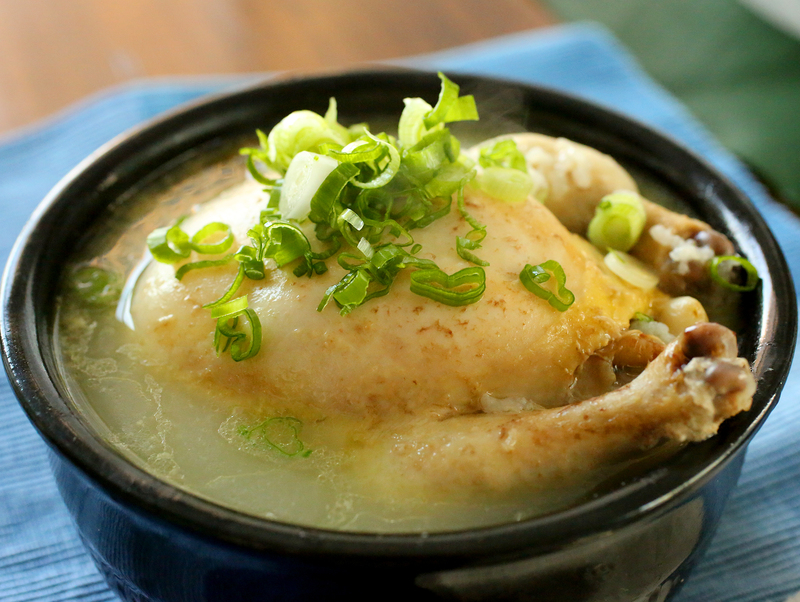 Ironically samgyetang is more popular in the summer among Koreans because we believe it helps us overcome hot summer heat by eating it. 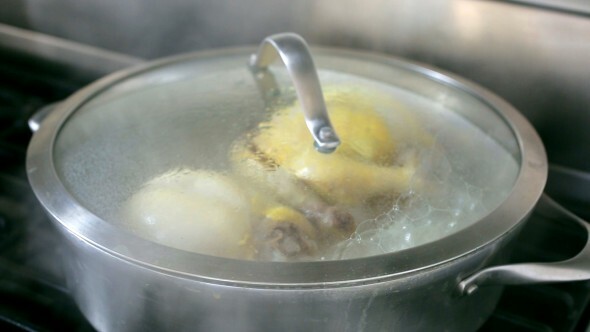 Sizzling hot samgyetang will warm your body in the summer.The room will seem colder than it was before you ate the soup, because your body is now warmer. Use only one root in this recipe if you eat it for the first time because 2 roots may be too strong and bitter for you. Posted October 29th, 2010 at 1:53 pm | Log in to reply. Posted September 24th, 2010 at 9:54 pm | Log in to reply. Posted September 16th, 2011 at 1:37 pm | Log in to reply. My mom just used a regular metal pot whenever she made this. Posted August 3rd, 2010 at 3:33 am | Log in to reply. Posted August 3rd, 2010 at 2:15 pm | Log in to reply. Posted August 20th, 2010 at 3:53 pm | Log in to reply. Posted August 20th, 2010 at 8:04 pm | Log in to reply. Posted July 5th, 2010 at 11:06 am | Log in to reply. Can we stuff the chicken with other ingredients beside rice? Also, is the jujubes a must or is there an alternative? I don’t think i can find jujubes here. Posted July 6th, 2010 at 6:43 am | Log in to reply. “Can we stuff the chicken with other ingredients beside rice?”: why not? Jujube is optional. Skip it if it’s not available in your area. Posted April 13th, 2010 at 8:38 pm | Log in to reply. 1. everything you make is so good! the recipies I have made after you are always delicious and I thank you! Posted April 13th, 2010 at 9:18 pm | Log in to reply. I’m very happy that you like my recipes! I will probably post the recipes without music from now on because of copyright law. Posted August 10th, 2010 at 8:36 pm | Log in to reply. Posted December 29th, 2009 at 1:21 pm | Log in to reply. Hello! I have a question with the rice. Do I have to use only sweet rice? or can I use regular rice also?? and does it have to be cooked before to soak in the water? Posted April 13th, 2010 at 9:22 pm | Log in to reply. no, you can use short grain rice, too. 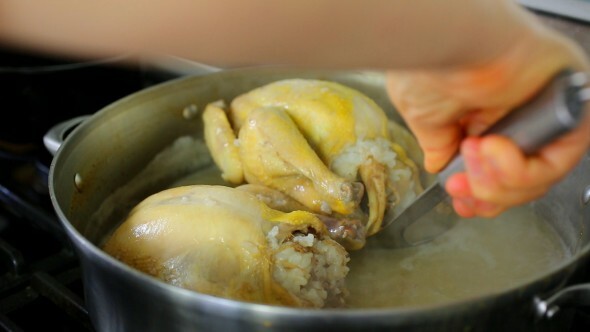 Yes, you will have to soak rice before stuffing in the chicken. Posted November 22nd, 2009 at 12:25 am | Log in to reply. Hello! My husband and I have been looking over you website for the last couple of weeks. We are currently living in Seoul but are going to be heading back in a few months. I wanted to start learning how to cook Korean food while I am here so we can eat it back in the states. We already tried cooking Daegujeon, Dubu buchim yangnyumjang, Japchae, and Kimchi chigae. Everything has turned out great. Tonight we are going to try cooking samgyetang since it is so cold outside right now. We are both excited. Thank you for all of the work you have put into this website. It will be a life saver when we move back to the U.S..
Posted November 8th, 2009 at 11:40 pm | Log in to reply. The video was watched 2,544,750 times on YouTube & has 33,696 likes! This video is a remade version of an earlier recipe. The original video was posted on and has 0 views.